CorePilot is an enterprise call center solution which provides intelligent skills-based call routing, real time proactive notification of abandoned calls, call queuing statistics and real time display of the waiting queues activity on agents' desktops. Sequential routing: route call to the first available agent. VIP routing: caller recognised as VIPs (by Core bridge’s Meta-Directory) is routed to an available VIP agent. Last agent call routing: route call to the agent who manages the caller account (or to the last agent who has spoken to the caller). Abandoned call notification: when a customer abandons call while waiting in a call queue, notification e-mail will be sent to pre-defined agent (or administrator) with the caller’s detailed information. The agent is therefore notified of the missed call and can call back the customer. Queue pop-up: when CorePilot server detects the presence of a call in a waiting queue; an alert message (pop-up) is automatically displayed on the agents workstations. The agents are then able to check the information related to waiting calls and prioritize response based on customers IDs (example: VIP calls). 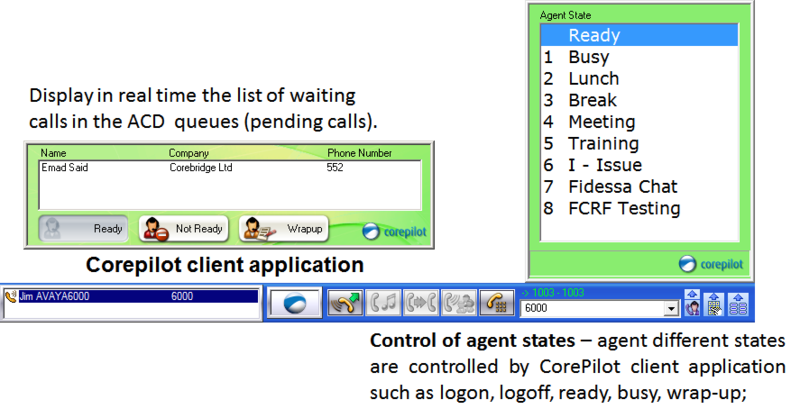 Control of agent states: agent different states are controlled by CorePilot client application such as logon, logoff, ready, busy, wrap-up; in addition, association of the ACD predefined reasons with “Busy” and “Logoff” states. Agent activities are integrated in Corebridge CoreTeam and CoreTraffic statistic modules.